In 2008, in a small store front on East 7th Street, Sara Jenkins opened Porchetta. It was a trendsetter in many ways. A well regarded chef helming a small restaurant with a singular focus. The focus being pork. A commitment to top ingredients. In 2012 this is business as usual, in 2008 it was unique. The results of Sara's efforts were a four star review in New York Magazine, the #1 item in Time Out New York's list of the Top 100 things they ate in 2008 and a successful restaurant still going strong. When Porchetta opened I had no idea what porchetta was. For the uninitiated, it is roasted pork, highly seasoned with crispy skin. This is street food in central Italy where it is traditionally made with a whole pig. At Porchetta, they use whole loins, with belly and skin attached, sourced from Niman Ranch. They are seasoned with garlic, rosemary, sage, salt and wild fennel pollen then slow roasted. The result is heavenly. Rich, juicy pork, perfectly seasoned, with crispy bits of skin adding crunch. You can have the porchetta as a plate or sandwich. I always go for the sandwich. Served on a ciabatta roll from Grand Daisy Bakery this is a sandwich of the highest order. Thanks to the success of Porchetta, porchetta can now be found on the menus of numerous restaurants, at street fairs and flea markets. Porchetta's is still the standard bearer for me. Four years on, with a second restaurant, Porsena, under Sara Jenkins command, Porchetta still delivers. Porchetta offers a few things to go with your plate or sandwich. Daily soups and salads are on offer. Sides include beans, cooking greens, crispy potatoes with burnt ends (as good as they sound) and daily specials. They are all delicious and compliment the main event. Boylans sodas and other drinks are available. There are days, when trying to decide what to have for lunch, I hear the siren call of Porchetta. I always answer and I am never dissapointed. You won't be either. First of all, Wishing all th best for 'Porchetta'. Thank you so much for letting know about such an awesome Restaurant. Trying different food is my hobby. Sure I will try it too. Sure it will be quite a tasty recipe. We have had better variety recipe from a fast food Mexican place in town. Glad to see you still posting recipes every once and a while. Had some friends over the other night and will entertain them with the dish. Very easy and wound highly recommend for any meal of the day. It is a motivational story for those who want to start their business at a low cost. As you told that your business started on the East 7th street and after a struggle now it turns into a big restaurant. Hard work always paid off. I'll surely write this story with the assistance of Cheap Essays professional writers online. They create the best content as your requirement at $4. The post looks at The Winner and Still Champion. 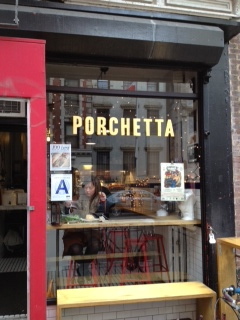 It says that in 2008, Sara Jenkins opened Porchetta. It was a trendsetter in many ways and in 2012, this is business as usual, in 2008 it was unique. The results of Sara's efforts were a four-star review in New York Magazine.